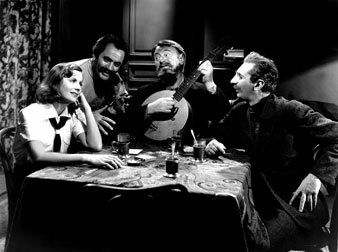 Everett Collection Greta Garbo, Alexander Granach, Sig Rumann, Felix Bressart singing in Ninotchka, 1939. Stars: Greta Garbo, Melvyn Douglas. You have surely read what a wonderful picture Ninotchka (MGM) is—smart, witty, mature, satirical, timely, presented with the famous “Lubitsch touch” and in addition with something entirely new—Greta Garbo as the screen’s funniest comedienne. I admit that this piling up of adjectives prejudiced me against the film. Yet I think genuine disillusionment was the cause of my disappointment when the show was over. I had laughed at witty lines, been pleasantly entertained by Lubitsch tricks (his method of implying more than he says gives the moviegoer the joy of co-creation), and—purest experience—admired Greta Garbo. But I was annoyed by the whole and still am. The theme of the picture is as old as any—the corruptibility of human nature by the good things of life. This time members of the Russian bureaucracy are put to the test. They come to Paris with a trunkful of jewels belonging to a former archduchess which they wish to sell because the Red Fatherland needs foreign exchange to buy tractors. Instead of being efficient, the commissars fall for the charm of Paris and the pleasures the capitalist world offers to its wealthy children. Greta Garbo is sent after the scoundrels but only for a short time does a better job than they. Soon she falls in love, buys a hat, gets drunk, too, and loses the jewels. But she quickly recovers them. The Archduchess loves the same man, and in exchange for him Commissar Ninotchka’s political career is saved and her honor restored. This turn of the script is especially clumsy. No man, and surely not this pair of creased trousers (Melvyn Douglas, truly elegant), would be worth such a fortune to a woman. The end, of course, is a happy one for the lovers. The details of this thin and rather stupid story are better than the whole. This column has generally no quarrel with scene-to-scene entertainment, serving a legitimate demand for relaxation, though it adds up to nothing. But the entertaining gags of this picture add up to something, and it is not pleasant. They assume an air of satire, thus pretending to a higher function and introducing a serious element. But satire needs more than the spirit of the entertainer. It requires a suitable target, which has to be hit. And satire demands sharp truthfulness. What Lubitsch and his scribblers do, besides providing laughter and shocks, is to ridicule higher aspiration and efforts. Perhaps they did not intend to, but they say to their audience: Wine (pardon, champagne), a little love-making, silk nightgowns, and top hats are what human beings want after all. Why try for more? The millions who will see this picture and be impressed by its technical expertness and sophistication will at the same time be effectively taught that Communists are “low” people. The substitution of the vices of the Stalin bureaucracy for the virtues of the revolutionaries of yesterday and tomorrow is a trick that is being more and more generally practiced. That the untidy and unshaven Russian commissars of the picture never existed in reality—Stalin always gave his traders enough money to “represent” lavishly—is a minor point ignored by a script which is manufactured and in not one scene really felt. As for the comedienne Greta Garbo, well, she is no comedienne. She is an exciting personality, a character, a great actress—but it is not she who makes one laugh but the contrast in the picture between her and everything else. Each “funny” scene she plays here could also be fitted into one of her tragic parts and would not be funny at all in another context. But as long as Garbo is on the screen one does not care why she is there. I could write much more about Ninotchka—its mixture of style, its unevenly written scenes, its opportunism, and its cynicism. But sparkling as is its champagne, I prefer the clear water of a picture like Harvest or the true exposure of human folly in The End of a Day.